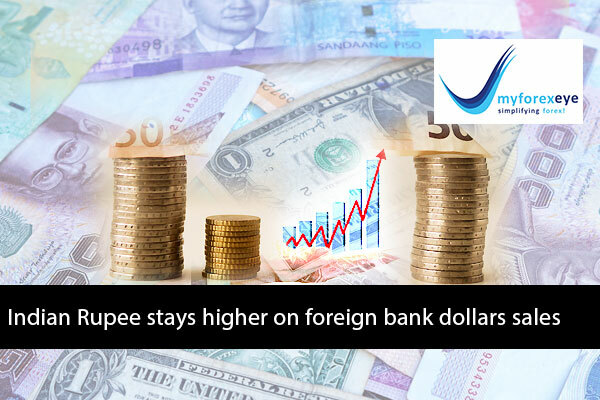 The Indian rupee was higher at 68.59/68.60 to a dollar, versus 68.67/68.68 at previous close, on greenback sales by foreign banks and expectation of inflows from a share sale in HDFC Bank. However, caution ahead of outcomes of monetary policy at home and the U.S. central bank policy meet tomorrow limited further gains. Indian shares fell on Tuesday after the recent record-setting spree, dragged by financials such as HDFC Bank Ltd. and Axis Bank Ltd., as investors focused on the central bank's bi-monthly policy meeting that will held tomorrow. The Sensex is down by 67.92 points or 0.18% at 37426.48 and the Nifty is lower by 13.90 points or 0.12% at 11305.65. The market breadth is narrow as 1252 shares have advanced, 1117 shares declined, and 137 shares are unchanged. Asian markets finished mixed today. The Hong Kong Hang Seng ended lower by 0.53% and the Shanghai Composite trading higher at 0.26%. European markets are trading higher today. The London's FTSE100 is rose by 0.16% followed by the France's CAC 40 at 0.12% and the Germany's DAX at 0.08%. The dollar index a measure of its value against a basket of six major currencies, was flat at 94.318, off a one-year high of 95.656 touched on July 19. Chinese Yuan is under pressure due to worries about the impact of a heated Sino-U.S. trade row and slowing growth, weakened 0.1 percent after falling to a 13-month low on Monday. The yuan was headed for its fourth straight month of weakening, the longest such streak since early 2015. The Japanese yen weakened against the dollar on Tuesday after the central bank pledged to keep interest rates low and adopted a forward guidance model to strengthen its commitment for its massive policy stimulus. All rights reserved. Myforexeye Fintech Private Limited (MFPL) news content received through this service is the intellectual property of Myforexeye Fintech Private Limited (MFPL). Republication or redistribution of content provided by Myforexeye Fintech Pvt Ltd is expressly prohibited without the prior written consent of Myforexeye Fintech Private Limited (MFPL), except for personal and non-commercial use. Myforexeye Fintech Private Limited (MFPL) shall not be liable for any errors, omissions or delays in content, or for any actions taken in reliance thereon.